Julie Heneghan visits Mary Green, wearing her Brighton "girlfriend" bracelet. 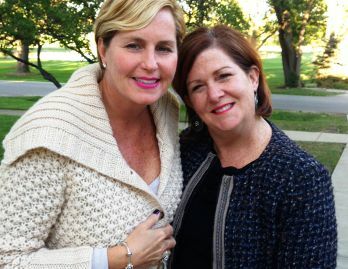 Good friends for 30 years, they co-founded Bunco For Breast Cancer. Since bunco is a simple dice game, based purely on luck, anyone can play and be a winner. The BFBC fundraisers are boisterous and fun. 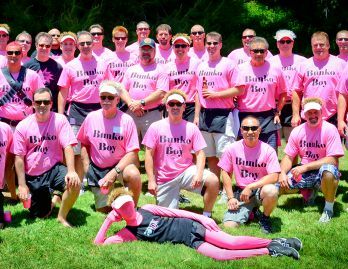 At the Rolling For Pink fundraisers in Santa Rosa Valley, California, the "bunco boys" are a main attraction. They cater to all the players' needs. 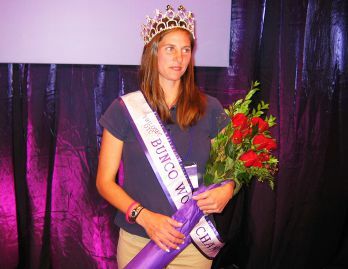 Two years before she founded Rolling For Pink, Sue Stonehouse won the Bunco World Championship in Las Vegas in 2006. 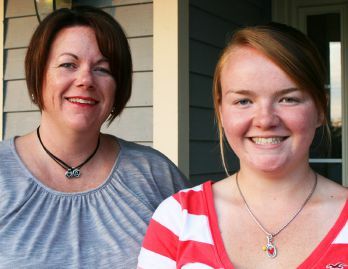 Moira Grimes runs Central New York BFBC with help from her daughter Brianna. She jokes that she works full-time to support their Brighton habit. In 1999, Mary Green is about to turn 40, and life is good. She’s happily married with four young kids, working part-time and living in a tight-knit suburb west of Chicago. She has no idea that she’s about to become the poster child for Bunco For Breast Cancer. The women foster those friendships over the years through activities such as a monthly bunco night. This simple dice game, played in groups of 12, enjoys huge popularity in the western suburbs of Chicago. Originally an 18th-century parlor game, it was rediscovered by women in the 1980s and resurged again in the past decade. Even The Real Housewives of Orange County has a bunco night. Shortly after Mary finishes her chemotherapy in 2001, her friend Kerry Comstock suggests that they donate their February bunco pot to breast cancer research. The idea grows into Bunco For Breast Cancer when they decide to ask other bunco groups in the area to participate. Along with Mary’s longtime friend, Julie Heneghan, the women start a fundraising trend that catches on around the country. As the poster child of BFBC, Mary finds herself in great demand. 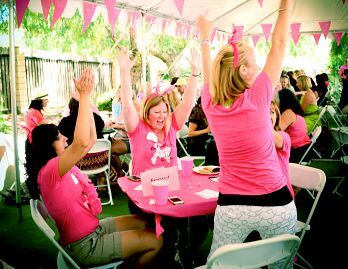 In four years, Rolling For Pink has raised $100,000 for BCRF through its lively bunco parties. In the western suburbs, Jeanne Fitzner, a breast cancer survivor since 2000, sparks to BFBC and starts Westmont, Illinois, Bunco in 2002. She begins with a small, 40-player group, raising $1,811.11. Last year, she hosted 300 people, raising $18,913. Cathy Thomas in nearby Elburn, Illinois, is also one of the early adopters, producing two-day bunco events with a team of five women. In 2004, Susan Martino of Woodstock, Illinois, sits with her daughters Laura Littner and Tracy Noe, as Laura, 37, undergoes chemotherapy for breast cancer. It’s a heartbreaking time for the Martino family. Tracy was diagnosed two years earlier, just before turning 32, when she developed a problem breastfeeding her six-month-old baby. Everyone is worried and anxious, since both daughters have young families, and Laura is having difficulty tolerating her treatments. When Tracy suggests they do something positive to break the mood, Laura remembers that a colleague worked on the Elburn bunco fundraisers. They decide to look into these events. After doing a lot of research, she determines that Breast Cancer Research Foundation best suits her criteria. So she’s delighted to learn from the Elburn organizers that the bunco events donate solely to that group. In fact, BCRF is taking the entire grassroots effort under its wing, relieving Mary Green of the overwhelming administrative duties. At the time, BCRF founder, Evelyn Lauder, assures Mary that every inquiry would be answered and every donor would be acknowledged with a personalized thank-you note. When Mary explains that hundreds of checks come in, some for as little as $2.90 from nursing homes, Evelyn responds that every penny counts.